This weekend marks one of our biggest family traditions of the year – Father’s Day Weekend at Arlington Park Racecourse. It just so happens that each year around this time is also one of the biggest horse racing events in the world – Royal Ascot. 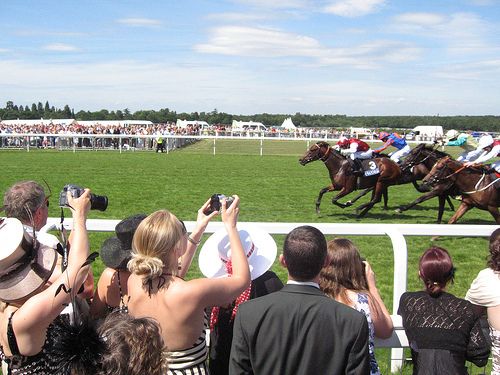 Steeped in pagentry and tradition, Royal Ascot is defintely the most popular race meeting in Britain, with over 300,000 guests attending Ascot over the 5-day event. It is also one of the many events still attended by Queen Elizabeth II. Although I may pretend our Father’s Day outing is like Royal Ascot, the blue frozen drinks and popcorn are no match for the high-end treats served in Britain. And, even though hats are plentiful at Arlington Park in the summer, the pomp and circumstance that the beautiful dresses, chapeaus, and facinators command is beyond compare. So what keeps me going to and writing about my big weekend at Arlington? It’s the beautiful grounds, the elegant horses, gorgeous flowers, the chance to buy and wear a new hat, and, most importantly, the thought that one day, maybe I’ll attend the real Royal Ascot – complete with fascinator attached.